Thailand is known for its soft, palm-fringed sands, golden temples, rich tribal culture, culinary delights and cities both modern and ancient. The three itineraries created here will give you a starting point for planning your two-week vacation there. Use these itineraries as a jumping off point of what your Thailand trip could entail. There is nothing more relaxing than unwinding on a pristine beach, watching the azure waves ebb and flow. Thailand offers an impressive number of beaches to choose from, making it a hot spot for a beach vacation with the added allure of great shopping and cultural attractions to round out the experience. After arriving in Bangkok, catch a short flight to Phuket, Thailand's biggest island in the Andaman Sea. There are 57 flights a day on a variety of airlines, and tickets cost around $50 round-trip depending on the time of day and season. There are many beaches to explore and cultural sites to see. One way to see Phuket is to stay a night or two each in Patong, the Karon Beach area, and Mai Khao. Patong Beach is the most popular and famous beach in Phuket, boasting three kilometers of white sand. 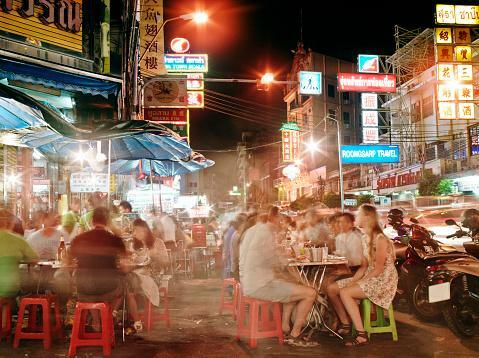 This area is best known for its hundreds of restaurants and lively nightlife on Bangla Road-if you are looking for a party, this is the beach to visit with a vibe similar to the Florida Keys, Thai style. Patong Beach also offers the Surf House that is popular with kids. Here you can learn to surf in a safe and controlled environment. If you like high flying adventure, visit the Flying Hanuman in the Patong Beach area. Here you will discover Phuket's rainforest canopy from above as you sail on a zipline through the rainforest. Karon Beach, located on the west side of the island, is the third longest beach on Phuket. This beach offers great snorkeling and diving spots. Visitors to this beach never feel crowded because it is so long. Karon Bazaar is between Woraburi Phuket Resort and Moenvenpick Resort, and is open daily from 10 a.m. until 10 p.m. or later, making it a great market to explore after a long day relaxing on the beach. Mai Khao Beach in the northwest is still relatively unspoiled and known for its gorgeous long beach with coarse sand that runs in a straight line for a full 11 kilometers. Note that it is dangerous to swim way out into the Andaman Sea here from May to November because of a sharp drop off. The Mai Khao Marine Turtle Foundation is located on the grounds of the JW Marriott and is open daily. Visiting the Turtle Foundation is free but donations are appreciated and go toward turtle conservation efforts. For kids, stop in at Splash Jungle Waterpark at the Grand West Sands Villa Phuket to find numerous water slides and the popular lazy river. To get away from the crowds, spend the day at Nai Thon Beach. The ride to this quiet beach that has escaped major development is beautiful and will take you through the lush rainforest and along the undulating coastline. The Chao Le Boat Floating Festival takes place here every December. Big Buddha Phuket, about 50 minutes from Phuket City, is made of white jade marble and is 45 meters high. The Phuket Big Buddha has the best 360 degree views of the southern part of Phuket Island, making it a great spot to visit at sunset. Visit Phromthep Cape for the best sunset on the island and save time to explore the lighthouse museum where you can see the distinctive shapes of the Phi Phi Islands, Koh Racha Yai and Koh Racha Noi. Leaving Phuket, take a flight to Koh Samui. 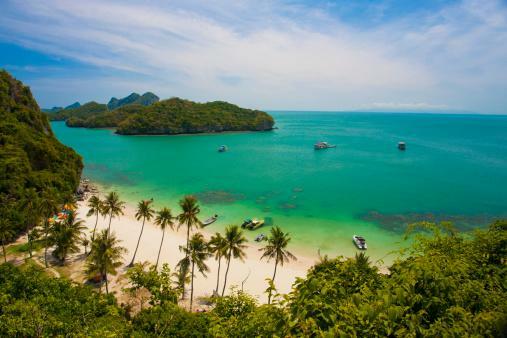 Known for its idyllic beaches, coconut groves, palm fringed beaches and mountainous rainforests, Thailand's third largest island is located in the Gulf of Thailand off the east coast of the Kra Isthmus. There are at least four one-hour flights a day from Phuket to Koh Samui on several domestic airlines. Prices start around $200. Chaweng Beach, lined with coconut trees, is approximately seven kilometers long, making it the longest beach on the east coast of the island. Idyllic by day and party central by night, this beach is just a few minutes ride from the airport and is a perfect jumping off point for a full day excursion to Ang Thong National Marine Park, about 45 minutes away by speed boat. Tour operators like Safari Boat offer day trips with such highlights as snorkeling, a walk to Emerald Lake, and kayaking. Explore the bustling Green Mango strip for restaurants, night markets, bars and nightlife. In the evening, hit up Lamai Night Plaza or take in Lamai Thai Boxing on Saturday nights. The second largest resort area, Lamai Beach is located on the east coast of the island. White powder sand, swaying palm trees and giant granite boulders define this beautiful beach. Silver Beach, located north of Lamai Beach, is set in a charming bay and offers a tranquil alternative. Bang Po Beach on the northwest coast of the island is another quiet escape. Tour the usual boulder formations of Hin Ta and Hin Yai. If you want to take a break from the beach with the kids, plan an afternoon at the Coco Splash Adventure & Water Park with four pools and seven slides. The Samui Aquarium and Tiger Show is perfect for family fun too. Highlights include tigers, leopards and colorful birds. Most of the fish on display at the aquarium are native to the Gulf of Thailand. For the adventurous, take a six-hour eco-Jungle Safari Tour of Koh Samui for just over $50. Highlights of this highly-rated tour include a swim under the Namuang waterfall, a tour of a rubber plantation and a visit to the Magic Buddha Garden. Depart Ko Samui for Bangkok. There are more than 21 flights daily and the flight time is just over an hour. Reaching Bangkok, there are four ways to get to Hua Hin, about 90 miles from Bangkok. Hua Hin is a mix of city and sea that is a favorite of Thai upper and middle class as well as Thai royalty. A fascinating night market, tons of great restaurants and beautiful beaches await. Take a morning tour to the Damnoen Saduak floating market. Shop for local crafts, visit the grounds of King Rama II Memorial Park, and explore Amphawa, another floating market with Thai delicacies. If you have always wanted to see an elephant up close, take a half-day tour at Kui Buri National Park. Highlights include the opportunity to view elephants eating and playing around a pond. At the colorful Hua Hin Night Market, merchants line the street with crafts and manufactured goods every night. 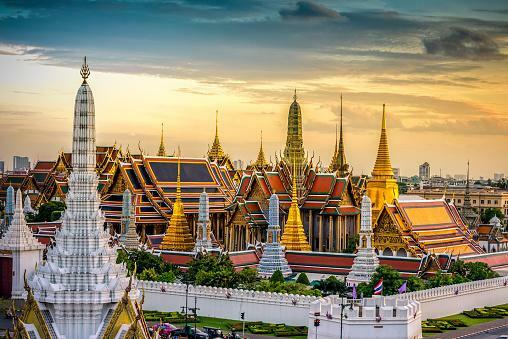 Thailand has a long, fascinating history and three major royal cities worth exploring. This cultural and architectural tour will take you from Bangkok to Ayutthaya by boat and then to Sukothai. In the morning, explore Bangkok by long tail boat on the Chao Praya River. Long tail boats take you past picturesque riverside homes, wooden homes on stilts, colonial mansions, businesses and villages that border this busy river. Most must-see temples in Bangkok are located near the Grand Palace, making them easily accessible on foot, by tuk tuk or by boat. 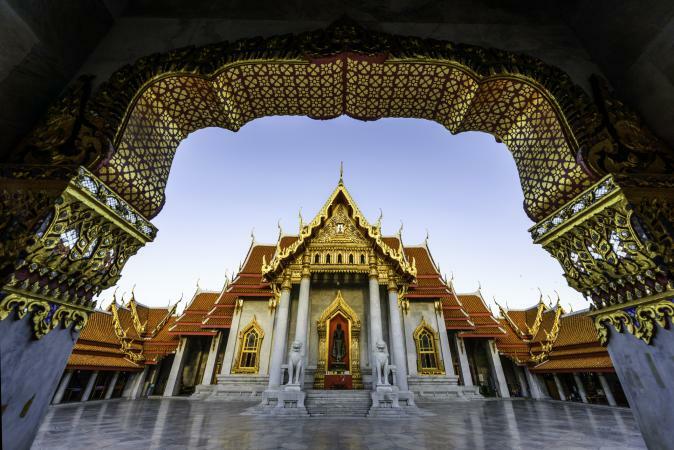 The variety of material used in the construction of temples in Bangkok ranges from broken porcelain pieces and gold gilded wood encrusted with colored mirrors to beautifully carved marble and teak. Wat Arun, or the Temple of Dawn, is named after Aruna, the Indian goddess of the dawn and dates to 1767. King Monhkut added the ornamentation of broken porcelain pieces that gives this temple its distinctive look. Just about everyone gets to Wat Arun by boat. If you take a canal tour by long-tailed boat, a stop at Wat Arun is usually included. Otherwise, take the Chaophraya Express Boat to the Tha Thien pier, then transfer to the cross-river ferry. Wat Phra Kaew, located on the grounds of the Grand Palace where the Thai royal family resides, is the most ornate and sacred temple in the country. It glitters with gold and is encrusted with mirrors and gems, and the doors are inlaid in lavish designs with mother of pearl. This wat is the home of the most sacred Emerald Buddha, the best view of which is from the back of the temple. Wat Po, the oldest temple in Thailand, is located behind the Temple of the Emerald Buddha in a different complex about a 10 to 15 minute walk away. Today, this lively temple is also an educational center for Buddhism. The main attraction is the large reclining Buddha. Be sure not to miss the feet of this Buddha, inlaid with mother of pearl and 108 auspicious signs of the Buddha. The wall paintings illustrate scenes from the Sri Lanken Buddhist chronicle Mahavamsa. Wat Mahatat, located between the Grand Palace and the Royal Palace, is the oldest institute for higher education of Buddhist monks in Thailand. There is a herbal medicine market on most weekends, as well as stalls selling a wide range of goods. Wat Phu Khao Thong offers a great view of Bangkok. Visitors will climb 300 steps to reach the summit of this 58-meter-wide chedi. Wat Traimit is located in Chinatown and has the largest gold Buddha in the world. Loha Prasat Temple is located in the old city. The walkways and maze-like corridors of this temple complex are lined with shrines and Buddhas. The easiest and cheapest way to access the temples of Bangkok is by boat. The Chao Praya River Express operates a regular boat service up and down the river. There is also a Chao Phraya Tourist Boat that drops visitors off at different temple sites and other attractions and shopping venues. The website details times, routing and fares. On average, a tourist all-day pass is about $4. Ayutthaya established itself as the successor of Sukhothai, the first capital of Siam, which it finally annexed in 1438. Ayutthaya was the capital of the Siamese Thai Kingdom from 1351 until 1767 when it was sacked by the Burmese. At the height of its power, it was one of the biggest and richest cities in Asia. Ayutthaya is a UNESCO World Heritage Site and one of the most impressive ruins of a city in Southeast Asia. The most romantic and scenic way to reach Ayutthaya from Bangkok is to take a two-day trip aboard a 100-year-old converted rice barge made of teak. Anantara Cruise Lines is among the most popular, with most people enjoying the dazzling scenery, excellent service, and delicious food. 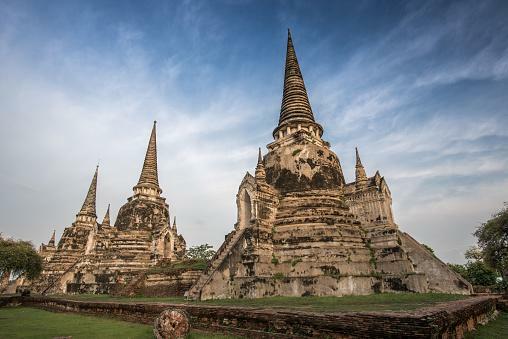 Following your two-day cruise, spend the next four days in Ayutthaya. Today, the ruins of the royal city sprawl amid buildings of the modern town. The easiest way to see the ruins is to rent a tuk tuk. To reach the outer ruins that are more off the beaten path, many visitors rent a boat. Wat Phra Si Sanphet served as a model for the Temple of the Emerald Buddha in Bangkok. This temple was part of the royal palace exclusively used by Ayutthayan kings. A fascinating description of what the temple was like can be found in Nicolas Gervaise's Histoire Naturelle et Politique du Royaume de Siam, originally published in 1688. Buddha figures from this temple are displayed at the National Museum in Bangkok. Wat Ratchaburana includes ruins of a monastery. Keep an eye out for the mural paintings that can still be seen inside the main prang. Additional paintings can be found in two crypts located in the lower part of the prang. Wat Mahathat is known as the "Temple of the Great Relics" and is located in the center of the modern town of Ayutthaya. A highlight here is the Buddha head embedded in a tree trunk. Wat Yai Chai Mongkol dates to 1357 A.D. and is located southeast of Ayutthaya across the Pridithamrong bridge. Two of the highlights include a large reclining Buddha that is usually draped in golden silk and a large impressive chedi. Bang Pa-in Palace dates to the 17th century and displays several architectural styles. The most interesting building and the only one open to the public is the Chinese style residence built in China and gifted to King Chulalongkorn in 1889. Chao Sam Phraya National Museum houses a number of sculptures and works from different periods throughout Thailand's early history. Of interest are a seated Buddha and a huge bust of the Buddha in the U Thong style. Originally established around 1238 as an outpost of the Khmer kingdom, the large trading center of Sukhothai eventually established its independence as "the kingdom of Sukhothai" where Thai culture grew and flourished. Sukhothai Buddha statues are some of the most revered art forms in Thailand with gentle curves and small mouths turned slightly upward into a mellow smile. The temples are located over a large historical park; there are nearly 200 excavated, some partially restored. It is best to rent a car, a tuk tuk or taxi to see the ruins. Wat Si Chum dates to the 13th century is known for its mondop (windowless cuboid construction) that has a large Buddha image visible from the outside wall. Wat Phra Phai Luang dates to the late 12th century and is built in the Khmer style of Angor Wat in Cambodia. 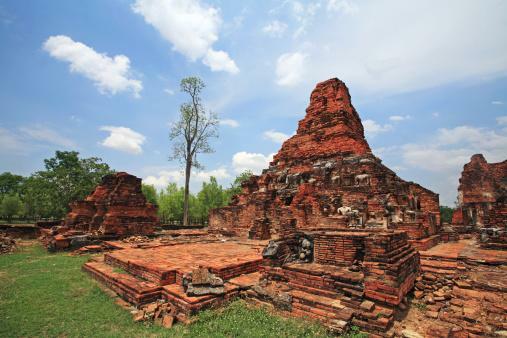 One of the oldest monuments in Sukhothai, the temple was originally dedicated to Vishnu; later in the Sukhothai era, it was converted into a Theravada Buddhist temple. What makes this temple fascinating is that it shows examples of different architectural styles, including Khmer, Sukhothai and Ayutthaya. Wat Saphan Hin is a small temple known for a 12-meter-high standing Buddha image overlooking the plains. Climb the path for a great view of the plains and ruins. Wat Sorasak, constructed in 1412, is unusual because of the 24 beautifully carved elephants that still guard the chedi of brick. Wat Sra Si is located on a pond surround by lotus flowers with Buddhas reflected in the water. Ten chedis and six rows of columns, as well as the beautiful statue of a seated Buddha, still stand and some of the wat's buildings are still inhabited by monks. One of the most iconic images, the walking Buddha, can be found here. On this tour, destinations include Bangkok, Chiang Mai, Kaeng Krachan National Park and several elephant farms and rehab centers in the Chiang Mai area. This itinerary is perfect for shoppers, naturalists and animal lovers. Arrive in Bangkok and visit the floating market to get a sense of what life is like on the river and what crafts are traded. Depart Bangkok for Kaeng Krachan National Park. Rent a jeep at the Chiang Mai airport and drive to this park famous for its diverse wildlife. There are 420 species of birds, 300 butterflies and 57 mammals. Choose between four campgrounds set beside the reservoir at Park Headquarters, deep in the lowland jungle at Ban Krang, high up in the mountains at Phanoen Thung, or near Pala-U Waterfall. Limited numbers of basic park-run bungalows are also available at Headquarters and Pala-U. If camping isn't your style, make a reservation at Baan Maka. Heading back to Chiang Mai, take a few days to visit the elephants of Thailand. Patara Elephant Farm is a breeding facility that allows visitors to interact with the elephants. Educational classes teach visitors about the care of elephants. If you want to spend a night or two at an elephant camp, book a room at Elephant Jungle Sanctuary, a joint venture between the Karen hill tribes and residents of Chiang Mai. They also offer half and full day visits, as well as the opportunity to walk with elephants. Elephant Nature Park is another option. This is an elephant rescue and rehabilitation center. 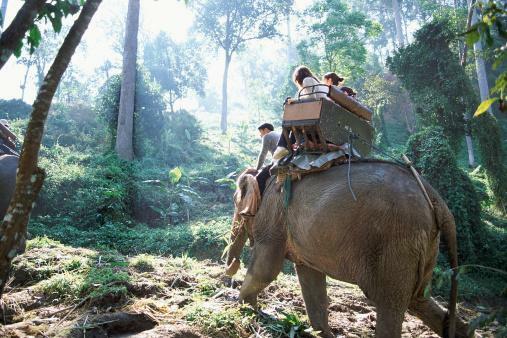 If you want to see elephants without leaving Chiang Mai, then volunteer for a day at The Elephant Jungle Paradise Park. This facility and experience has five-star reviews on Google. The number of crafts and markets to be found in Chiang Mai boggles the mind and offers days of shopping at prices that are usually more reasonable than those found in Bangkok. The nearby hill tribe crafts are easy to find here as well. Warorot Market is located in the Chinatown section of Chiang Mai and sells clothes and food inside a building and has many vendors that sprawl outside the building selling everything from flowers to ceramics, jewelry to woodcarvings. Many locals shop at this day market that closes when it gets dark. Hill Tribe and Northern Hill Tribe Market is located behind the Warorot Market and offers various tribal textiles, clothing, jewelry and carvings. Kham Tiang Flower Market is also within walking distance of the Warorot Market, and is best seen in the early morning when the vendors are setting up their artful and colorful displays of flowers. Morning Markets at Chiang Mai Gates starts at 4:30 a.m. and provides a glimpse of local life. Saturday and Sunday Night Walking Street markets that take place on Wualai Road (Saturday) and on Rachadamnoen Road (Sunday) are favorites among visitors because of the scope and variety of items offered. Night Bazaar is open every night and is another favorite of visitors. Here you will find famous knock-offs, crafts, fine silks, jewelry and much more. Make sure that you haggle as this is a great place to find bargains. Muang Mai Market is for visitors who love tropical fruits. This market leads into a maze of food stalls offering everything from seafood to local meats and vegetables. This vibrant city has some of the best and biggest markets in the world and there are several that should not be missed. 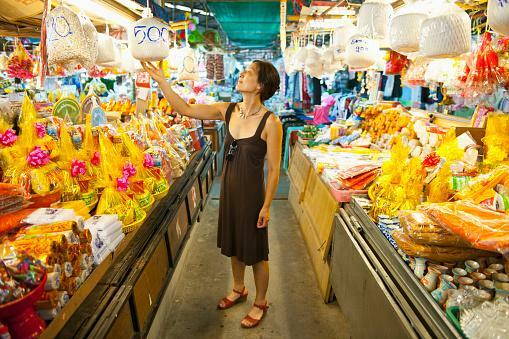 Markets are a big part of daily life in Bangkok, and the main place where locals shop. Chatuchak Weekend Market is the ultimate market in Bangkok where 15,000 booths sell everything imaginable at bargain prices. The list of items offered come from all over Thailand and include antique wood carvings, jewelry, handicrafts, local souvenirs, Buddhist amulets, furniture, clothes, silk, ceramics, hill-tribe outfits, food and much more. It is easy to spend two days at this market that is divided into 27 areas. Pak Klong Talat Flower Market is a colorful market where you can watch vendors make offerings and bouquets 24 hours a day. This market is best seen in the early morning when the stalls are fully stocked with flowers, fruits and vegetables. The Market Experience tour company offers a tour of the flower market combined with a cooking class. Pratunam Market is an indoor market with booths that also line the nearby street. Find clothes, shoes, and accessories like jewelry, handbags and sunglasses, with everything at wholesale prices. In planning your visit to Thailand, keep some of these key tips and insights in mind. Most cities in Thailand offer a wide range of lodging choices with prices that range from budget and moderate to high end hotels. One of the best sources of booking a room in Thailand is to work with Agoda Hotels, part of The Priceline Group. This service offers discounted hotels in all budget categories and each hotel offered is reviewed by people who have stayed there. This site typically has more heavily discounted offers for international accommodations for Thailand than hotels.com. If you travel as local Thais do, eat in local restaurants, stay in hotels without air conditioning and use bus or train transportation, visiting Thailand can be quite inexpensive. Once you add in a bit of luxury, prices go up; a hotel on the river will cost an average of $250 a night whereas a hotel in certain areas of the city can run between $50 and $100 a night (and some much less). During the peak tourist season that runs from October to March, hotels charge more and rates go even higher from the second week of December through January 5. It is best to shop around and book ahead for hotels and airline tickets. Visitors should be respectful at wats and in front of any Buddha images. While Thailand is known as the "land of smiles," there are rules of etiquette that should be followed when entering any wat. Some are common sense, and others are based on local culture and beliefs. Always be respectful in front of a Buddha image. Never lose your temper; confrontation is considered rude and a loss of face. Wear long pants or a long skirt to cover your legs when entering a temple. Do not wear a shirt that bears your shoulders or upper arms. Do not wear flip flops to a temple; wear proper shoes with socks. When entering any temple building, shoes must come off. You can leave your socks on, so you might want to bring another pair. Do not step on any threshold of wat buildings, because Thai people believe one of the nine spirits that live in the temple reside in the threshold. No matter how small, you must never sit with your feet pointing at a niche or Buddha image. 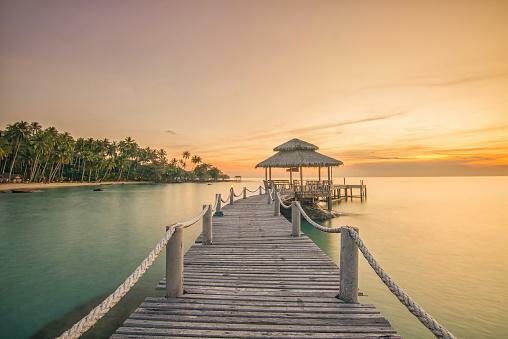 There is so much to see and do in Thailand, making it a truly amazing destination. Thailand offers something for everyone from shoppers and animal lovers to sybarites who want to unwind on the beach. Whether you rough it in the rainforest in a rustic teak house, stay in a posh hotel on the banks of the Chao Phraya River or unwind in a beach bungalow listening to the sound of the ocean, Thailand is a theater of culture and contrasts that is compelling and unforgettable.